Five years ago, with slurred speech, numbness in my arm, and difficulty breathing, I was admitted to the emergency room. All the signs of a heart attack. Surely, this wasn’t happening. I was only 34. Living with high levels of stress was putting my entire body and life at risk. After much care and tests, the doctors were able to rule out a heart attack, but not without warning. Looking at me, the doctor said words that changed my life. This was my crossroads moment. Would I live my life dictated by stressors missing out on the full life God had designed for me? Or would I learn to truly learn to rest in God placing my cares in Him so that I could walk out His purpose and will for my life? Leaving that hospital, I was filled with praise. I was given another chance to fully live the life God had given me. I had one more day to love my husband and family. I had another opportunity to walk in my purpose. Nope. This would NOT be my ending. I made up my mind that stress would no longer hold me captive. I was breaking free. To do that, I had to make some lifestyle changes. Even though we all may experience occasional moments of stress, we were not designed to live a life stressed out. 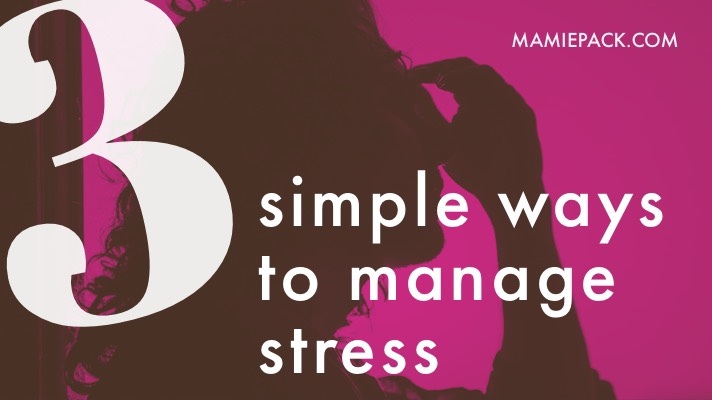 Here are three healthy techniques that aid me in managing stress in a healthy way so that I can continue to enjoy my life. Self-care is a priority, not an option. Taking care of myself became one of the areas I sacrificed in my effort to handle “everything.” Ignoring taking care of yourself, especially during stressful situations, can increase the harmful effects of stress on our bodies. When we put off taking care of our bodies, we can increase our chances of developing stress-related illnesses like insomnia, excessive weight gain, digestive issues, and mood swings. Unfortunately, during that season, I was experiencing them all. Developing a healthy bedtime routine: Adequate sleep helps to fuel proper thinking and functioning of our bodies. Lack of sleep impacts our moods and can cause us to respond irrationally. Exercising regularly: Whether it is a brisk walk around the neighborhood or going to the gym, exercising helps with processing stress. Relaxing: Set time aside each day in your schedule for you to relax and protect that time. Eating healthy: One of the culprits of weight gaining, while stressed, is often linked to poor eating habits. Spend time planning your meals, especially on days that you are stretched more than usual. Although developing healthy habits are essential aids in managing our lives externally, these habits cannot fix what is happening internally. Prayer is a vital tool in developing consistent changes for a healthy life. A part of living with stress versus experiencing a stressful moment is often rooted in our perspective. Where are your thoughts? Is the pain you are experiencing on constant replay? Are you talking more about your heartbreak than healing? When we choose to change our perspective from our problems to prayer, a shift happens in our hearts. We can see that Christ is our ever-present help. Developing a consistent prayer life changes our thoughts from mindless to mindful. Our thoughts shift from focusing on our problems to focusing on our all powerful, all knowing God. So how can we use prayer to manage our stress? Immerse yourself in scripture: What does the Bible say about your situation? Use the scriptures to pray for your situation. Surround yourself with the word: Place scripture about your situation in your car, above your kitchen sink, or write them on the mirror in your bathroom so that you can meditate on God’s truth versus idolizing the stressful situation. Pray about it before you talk about it: Going to those we trust for support is important, but it should not take the place of going to God first. Stress tends to happen when we are overworked, tired, sick, or outside of our routine. We say “yes” to one too many responsibilities and stretch ourselves too thin causing us to feel an overwhelming level of stress. Or maybe stress builds when we are faced to deal with a broken heart, caring for a sick family member, or circumstances outside of our control. Life just becomes hard. Any moment we might just cave from the pressure. The guilt we feel takes us captive preventing us from seeing beyond the “shoulda, coulda, woulda” moments of life. Taking a step back, we must learn to extend grace to ourselves. When we are surrendered to Christ, grace is more than our weak earthly attempt to excuse our shortcomings. Grace is a reflection of all that Christ has already done for us. In Him, we can see His grace in the big and small experiences. We simply have to open our hearts to receive. I think as mothers, we ask to much things to be done from us. We need sone relaxing and doing nothing time. If we do not have such time, then we just can’t step forward withought stress. Our expectations can be too high and only led us to feeling inadequate. That’s not fair to us or others. Thank God you were ok and have been able to work towards reducing stress since then!! It’s definitely something I need to work on as well. How scary that stress took such a toll on you. I’m glad that you found ways to deal with stress. Thanks for sharing these! I have a lot of stress in my life and I need to take better care of myself. Most women do and we often ignore it in our effort to take care of others. I’ve seen so many people myself included impact their health by high levels of stress. Whenever I feel my immune system down or I’m getting sick it reminds me to stick to my night routine and getting enough rest or sleep. Rest and sleep are two essentials to a healthy lifestyle for sure! Wow! What a life changing moment. I am glad you are okay and have altered things in your life to be healthier. Yes it does! Is such a blessing to have the opportunity to make changes. You are so right, taking care of yourself is so important. Fill the well before you can take from it. Thank you for the reminder! I am really bad at this. I need to try to be better at it. Oh, I get that for sure. Just pick on place to start then start. I’ve really put a lot of focus on self care over the past few years– boy does it help! Yay!!! What are your favorite self-care routines? Stressn is not healthy for our body at all. My husband and I use to be stress all the time when things done go right but then we noticed the impact it brings to ourselves and decided to take action and chance how we handle it. Self-care is very important. That is wonderful you and your husband talked together and made healthy decisions. That is a BIG step toward healthy living.